When a stem cell self-renews it divides and does not disrupt the undifferentiated state. This self-renewal demands control of cell cycle as well as upkeep of multipotency or pluripotency, which all depends on the stem cell. Embryonic stem cells (ESCs) are the cells of the inner cell mass of a blastocyst, formed prior to implantation in the uterus. In human embryonic development the blastocyst stage is reached 4–5 days after fertilization, at which time it consists of 50–150 cells. ESCs are pluripotent and give rise during development to all derivatives of the three germ layers: ectoderm, endoderm and mesoderm. In other words, they can develop into each of the more than 200 cell types of the adult body when given sufficient and necessary stimulation for a specific cell type. They do not contribute to the extraembryonic membranes or to the placenta. During embryonic development the cells of the inner cell mass continuously divide and become more specialized. For example, a portion of the ectoderm in the dorsal part of the embryo specializes as 'neurectoderm', which will become the future central nervous system. [page needed] Later in development, neurulation causes the neurectoderm to form the neural tube. At the neural tube stage, the anterior portion undergoes encephalization to generate or 'pattern' the basic form of the brain. At this stage of development, the principal cell type of the CNS is considered a neural stem cell. The neural stem cells self-renew and at some point transition into radial glial progenitor cells (RGPs). Early-formed RGPs self-renew by symmetrical division to form a reservoir group of progenitor cells. These cells transition to a neurogenic state and start to divide asymmetrically to produce a large diversity of many different neuron types, each with unique gene expression, morphological, and functional characteristics. The process of generating neurons from radial glial cells is called neurogenesis. The radial glial cell, has a distinctive bipolar morphology with highly elongated processes spanning the thickness of the neural tube wall. It shares some glial characteristics, most notably the expression of glial fibrillary acidic protein (GFAP). The radial glial cell is the primary neural stem cell of the developing vertebrate CNS, and its cell body resides in the ventricular zone, adjacent to the developing ventricular system. Neural stem cells are committed to the neuronal lineages (neurons, astrocytes, and oligodendrocytes), and thus their potency is restricted. 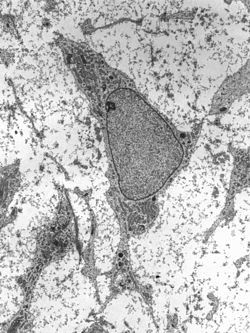 Nearly all research to date has made use of mouse embryonic stem cells (mES) or human embryonic stem cells (hES) derived from the early inner cell mass. Both have the essential stem cell characteristics, yet they require very different environments in order to maintain an undifferentiated state. Mouse ES cells are grown on a layer of gelatin as an extracellular matrix (for support) and require the presence of leukemia inhibitory factor (LIF) in serum media. A drug cocktail containing inhibitors to GSK3B and the MAPK/ERK pathway, called 2i, has also been shown to maintain pluripotency in stem cell culture. Human ESCs are grown on a feeder layer of mouse embryonic fibroblasts and require the presence of basic fibroblast growth factor (bFGF or FGF-2). Without optimal culture conditions or genetic manipulation, embryonic stem cells will rapidly differentiate. A human embryonic stem cell is also defined by the expression of several transcription factors and cell surface proteins. The transcription factors Oct-4, Nanog, and Sox2 form the core regulatory network that ensures the suppression of genes that lead to differentiation and the maintenance of pluripotency. The cell surface antigens most commonly used to identify hES cells are the glycolipids stage specific embryonic antigen 3 and 4, and the keratan sulfate antigens Tra-1-60 and Tra-1-81. The molecular definition of a stem cell includes many more proteins and continues to be a topic of research. Because of their combined abilities of unlimited expansion and pluripotency, embryonic stem cells remain a theoretically potential source for regenerative medicine and tissue replacement after injury or disease., however, there are currently no approved treatments using ES cells. The first human trial was approved by the US Food and Drug Administration in January 2009. However, the human trial was not initiated until October 13, 2010 in Atlanta for spinal cord injury research. On November 14, 2011 the company conducting the trial (Geron Corporation) announced that it will discontinue further development of its stem cell programs. Differentiating ES cells into usable cells while avoiding transplant rejection are just a few of the hurdles that embryonic stem cell researchers still face.Embryonic stem cells, being pluripotent, require specific signals for correct differentiation — if injected directly into another body, ES cells will differentiate into many different types of cells, causing a teratoma. Ethical considerations regarding the use of unborn human tissue are another reason for the lack of approved treatments using embryonic stem cells. Many nations currently have moratoria or limitations on either human ES cell research or the production of new human ES cell lines. Most adult stem cells are lineage-restricted (multipotent) and are generally referred to by their tissue origin (mesenchymal stem cell, adipose-derived stem cell, endothelial stem cell, dental pulp stem cell, etc.). Muse cells (multi-lineage differentiating stress enduring cells) are a recently discovered pluripotent stem cell type found in multiple adult tissues, including adipose, dermal fibroblasts, and bone marrow. While rare, muse cells are identifiable by their expression of SSEA-3, a marker for undifferentiated stem cells, and general mesenchymal stem cells markers such as CD105. When subjected to single cell suspension culture, the cells will generate clusters that are similar to embryoid bodies in morphology as well as gene expression, including canonical pluripotency markers Oct4, Sox2, and Nanog. With the increasing demand of human adult stem cells for both research and clinical purposes (typically 1–5 million cells per kg of body weight are required per treatment) it becomes of utmost importance to bridge the gap between the need to expand the cells in vitro and the capability of harnessing the factors underlying replicative senescence. Adult stem cells are known to have a limited lifespan in vitro and to enter replicative senescence almost undetectably upon starting in vitro culturing. It is possible to collect amniotic stem cells for donors or for autologous use: the first US amniotic stem cells bank  was opened in 2009 in Medford, MA, by Biocell Center Corporation and collaborates with various hospitals and universities all over the world. However, reprogramming allows for the creation of pluripotent cells, induced pluripotent stem cells (iPSCs), from adult cells. These are not adult stem cells, but adult cells (e.g. epithelial cells) reprogrammed to give rise to cells with pluripotent capabilities. Using genetic reprogramming with protein transcription factors, pluripotent stem cells with ESC-like capabilities have been derived. The first demonstration of induced pluripotent stem cells was conducted by Shinya Yamanaka and his colleagues at Kyoto University. They used the transcription factors Oct3/4, Sox2, c-Myc, and Klf4 to reprogram mouse fibroblast cells into pluripotent cells. Subsequent work used these factors to induce pluripotency in human fibroblast cells. Junying Yu, James Thomson, and their colleagues at the University of Wisconsin–Madison used a different set of factors, Oct4, Sox2, Nanog and Lin28, and carried out their experiments using cells from human foreskin. However, they were able to replicate Yamanaka's finding that inducing pluripotency in human cells was possible. Induced pluripotent stem cells differ from embryonic stem cells. They share many similar properties, such as pluripotency and differentiation potential, the expression of pluripotency genes, epigenetic patterns, embryoid body and teratoma formation, and viable chimera formation, but there are many differences within these properties. The chromatin of iPSCs appears to be more "closed" or methylated than that of ESCs. Similarly, the gene expression pattern between ESCs and iPSCs, or even iPSCs sourced from different origins. There are thus questions about the "completeness" of reprogramming and the somatic memory of induced pluripotent stem cells. Despite this, inducing adult cells to be pluripotent appears to be viable. Furthermore, induced pluripotent stem cells provide several therapeutic advantages. Like ESCs, they are pluripotent. They thus have great differentiation potential; theoretically, they could produce any cell within the human body (if reprogramming to pluripotency was "complete"). Moreover, unlike ESCs, they potentially could allow doctors to create a pluripotent stem cell line for each individual patient. Frozen blood samples can be used as a valuable source of induced pluripotent stem cells. Patient specific stem cells allow for the screening for side effects before drug treatment, as well as the reduced risk of transplantation rejection. Despite their current limited use therapeutically, iPSCs hold create potential for future use in medical treatment and research. 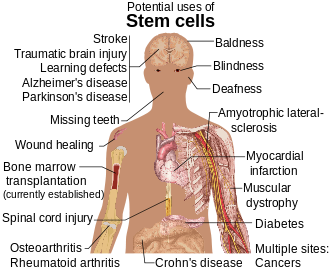 Stem cell therapy is the use of stem cells to treat or prevent a disease or condition. Bone marrow transplant is a form of stem cell therapy that has been used for many years without controversy. Stem cell treatments may lower symptoms of the disease or condition that is being treated. The lowering of symptoms may allow patients to reduce the drug intake of the disease or condition. Stem cell treatment may also provide knowledge for society to further stem cell understanding and future treatments. Male infertility due to absence of spermatogonial stem cells. In recent studies, scientist have found a way to solve this problem by reprogramming a cell and turning it into a spermatozoon. Other studies have proven the restoration of spermatogenesis by introducing human iPSC cells in mice testicles. This could mean the end of azoospermia. Female infertility: oocytes made from embryonic stem cells. Recently, scientists have found the ovarian stem cells, a rare type of cells (0,014%) found in the ovary. It is not clear their existence yet, but the impact it could have are limitless. It could be used as a treatment not only for infertility, but also for premature ovarian insufficiency. ^ Becker AJ, McCULLOCH EA, Till JE (February 1963). "Cytological demonstration of the clonal nature of spleen colonies derived from transplanted mouse marrow cells". Nature. 197 (4866): 452–4. Bibcode:1963Natur.197..452B. doi:10.1038/197452a0. PMID 13970094. ^ Siminovitch L, Mcculloch EA, Till JE (December 1963). "THE DISTRIBUTION OF COLONY-FORMING CELLS AMONG SPLEEN COLONIES". Journal of Cellular and Comparative Physiology. 62 (3): 327–36. doi:10.1002/jcp.1030620313. PMID 14086156. ^ a b c d e f Schöler, Hans R. (2007). "The Potential of Stem Cells: An Inventory". In Nikolaus Knoepffler; Dagmar Schipanski; Stefan Lorenz Sorgner. Humanbiotechnology as Social Challenge. Ashgate Publishing. p. 28. ISBN 978-0-7546-5755-2. ^ Mitalipov S, Wolf D (2009). Totipotency, pluripotency and nuclear reprogramming. Advances in Biochemical Engineering/Biotechnology. 114. pp. 185–99. Bibcode:2009esc..book..185M. doi:10.1007/10_2008_45. ISBN 978-3-540-88805-5. PMC 2752493. PMID 19343304. ^ Ulloa-Montoya F, Verfaillie CM, Hu WS (July 2005). "Culture systems for pluripotent stem cells". Journal of Bioscience and Bioengineering. 100 (1): 12–27. doi:10.1263/jbb.100.12. PMID 16233846. ^ Sekhar, Lalitha; Bisht, Neelam (2006-09-01). "Stem Cell Therapy". Apollo Medicine. 3 (3): 271–276. doi:10.1016/S0976-0016(11)60209-3. ISSN 0976-0016. ^ Thomson JA, Itskovitz-Eldor J, Shapiro SS, Waknitz MA, Swiergiel JJ, Marshall VS, Jones JM (November 1998). "Embryonic stem cell lines derived from human blastocysts". Science. 282 (5391): 1145–7. Bibcode:1998Sci...282.1145T. doi:10.1126/science.282.5391.1145. PMID 9804556. ^ Rakic P (October 2009). "Evolution of the neocortex: a perspective from developmental biology". Nature Reviews. Neuroscience. 10 (10): 724–35. doi:10.1038/nrn2719. PMC 2913577. PMID 19763105. ^ Noctor SC, Flint AC, Weissman TA, Dammerman RS, Kriegstein AR (February 2001). "Neurons derived from radial glial cells establish radial units in neocortex". Nature. 409 (6821): 714–20. doi:10.1038/35055553. PMID 11217860. ^ Ying QL, Wray J, Nichols J, Batlle-Morera L, Doble B, Woodgett J, Cohen P, Smith A (May 2008). "The ground state of embryonic stem cell self-renewal". Nature. 453 (7194): 519–23. Bibcode:2008Natur.453..519Y. doi:10.1038/nature06968. PMC 5328678. PMID 18497825. ^ Chambers I, Colby D, Robertson M, Nichols J, Lee S, Tweedie S, Smith A (May 2003). "Functional expression cloning of Nanog, a pluripotency sustaining factor in embryonic stem cells". Cell. 113 (5): 643–55. doi:10.1016/S0092-8674(03)00392-1. PMID 12787505. ^ Boyer LA, Lee TI, Cole MF, Johnstone SE, Levine SS, Zucker JP, Guenther MG, Kumar RM, Murray HL, Jenner RG, Gifford DK, Melton DA, Jaenisch R, Young RA (September 2005). "Core transcriptional regulatory circuitry in human embryonic stem cells". Cell. 122 (6): 947–56. doi:10.1016/j.cell.2005.08.020. PMC 3006442. PMID 16153702. ^ Adewumi O, et al. (The International Stem Cell Initiative) (July 2007). "Characterization of human embryonic stem cell lines by the International Stem Cell Initiative". Nature Biotechnology. 25 (7): 803–16. doi:10.1038/nbt1318. PMID 17572666. ^ Mahla RS (2016). "Stem Cells Applications in Regenerative Medicine and Disease Therapeutics". International Journal of Cell Biology. 2016 (7): 1–24. doi:10.1155/2016/6940283. PMC 4969512. PMID 27516776. ^ Wu DC, Boyd AS, Wood KJ (May 2007). "Embryonic stem cell transplantation: potential applicability in cell replacement therapy and regenerative medicine". Frontiers in Bioscience. 12 (8–12): 4525–35. doi:10.2741/2407. PMID 17485394. ^ Jiang Y, Jahagirdar BN, Reinhardt RL, Schwartz RE, Keene CD, Ortiz-Gonzalez XR, Reyes M, Lenvik T, Lund T, Blackstad M, Du J, Aldrich S, Lisberg A, Low WC, Largaespada DA, Verfaillie CM (July 2002). "Pluripotency of mesenchymal stem cells derived from adult marrow". Nature. 418 (6893): 41–9. doi:10.1038/nature00870. PMID 12077603. ^ Coughlin RP, Oldweiler A, Mickelson DT, Moorman CT (October 2017). "Adipose-Derived Stem Cell Transplant Technique for Degenerative Joint Disease". Arthroscopy Techniques. 6 (5): e1761–e1766. doi:10.1016/j.eats.2017.06.048. PMC 5795060. PMID 29399463. ^ Ratajczak MZ, Machalinski B, Wojakowski W, Ratajczak J, Kucia M (May 2007). "A hypothesis for an embryonic origin of pluripotent Oct-4(+) stem cells in adult bone marrow and other tissues". Leukemia. 21 (5): 860–7. doi:10.1038/sj.leu.2404630. PMID 17344915. ^ Narasipura SD, Wojciechowski JC, Charles N, Liesveld JL, King MR (January 2008). "P-Selectin coated microtube for enrichment of CD34+ hematopoietic stem and progenitor cells from human bone marrow". Clinical Chemistry. 54 (1): 77–85. doi:10.1373/clinchem.2007.089896. PMID 18024531. ^ Terai S, Ishikawa T, Omori K, Aoyama K, Marumoto Y, Urata Y, Yokoyama Y, Uchida K, Yamasaki T, Fujii Y, Okita K, Sakaida I (October 2006). "Improved liver function in patients with liver cirrhosis after autologous bone marrow cell infusion therapy". Stem Cells. 24 (10): 2292–8. doi:10.1634/stemcells.2005-0542. PMID 16778155. ^ Subrammaniyan R, Amalorpavanathan J, Shankar R, Rajkumar M, Baskar S, Manjunath SR, Senthilkumar R, Murugan P, Srinivasan VR, Abraham S (September 2011). "Application of autologous bone marrow mononuclear cells in six patients with advanced chronic critical limb ischemia as a result of diabetes: our experience". Cytotherapy. 13 (8): 993–9. doi:10.3109/14653249.2011.579961. PMID 21671823. ^ Dedeepiya VD, Rao YY, Jayakrishnan GA, Parthiban JK, Baskar S, Manjunath SR, Senthilkumar R, Abraham SJ (2012). "Index of CD34+ Cells and Mononuclear Cells in the Bone Marrow of Spinal Cord Injury Patients of Different Age Groups: A Comparative Analysis". Bone Marrow Research. 2012: 1–8. doi:10.1155/2012/787414. PMC 3398573. PMID 22830032. ^ Gardner RL (March 2002). "Stem cells: potency, plasticity and public perception". Journal of Anatomy. 200 (Pt 3): 277–82. doi:10.1046/j.1469-7580.2002.00029.x. PMC 1570679. PMID 12033732. ^ Behrens A, van Deursen JM, Rudolph KL, Schumacher B (March 2014). "Impact of genomic damage and ageing on stem cell function". Nature Cell Biology. 16 (3): 201–7. doi:10.1038/ncb2928. PMC 4214082. PMID 24576896. ^ Barrilleaux B, Phinney DG, Prockop DJ, O'Connor KC (November 2006). "Review: ex vivo engineering of living tissues with adult stem cells". Tissue Engineering. 12 (11): 3007–19. CiteSeerX 10.1.1.328.2873. doi:10.1089/ten.2006.12.3007. PMID 17518617. ^ Gimble JM, Katz AJ, Bunnell BA (May 2007). "Adipose-derived stem cells for regenerative medicine". Circulation Research. 100 (9): 1249–60. doi:10.1161/01.RES.0000265074.83288.09. PMC 5679280. PMID 17495232. ^ Kuroda Y, Kitada M, Wakao S, Nishikawa K, Tanimura Y, Makinoshima H, Goda M, Akashi H, Inutsuka A, Niwa A, Shigemoto T, Nabeshima Y, Nakahata T, Nabeshima Y, Fujiyoshi Y, Dezawa M (May 2010). "Unique multipotent cells in adult human mesenchymal cell populations". Proceedings of the National Academy of Sciences of the United States of America. 107 (19): 8639–43. Bibcode:2010PNAS..107.8639K. doi:10.1073/pnas.0911647107. PMC 2889306. PMID 20421459. ^ Oliveira PH, da Silva CL, Cabral JM (2014). "Genomic Instability in Human Stem Cells: Current Status and Future Challenges". Stem Cells. 32 (11): 2824–2832. doi:10.1002/stem.1796. PMID 25078438. ^ De Coppi P, Bartsch G, Siddiqui MM, Xu T, Santos CC, Perin L, Mostoslavsky G, Serre AC, Snyder EY, Yoo JJ, Furth ME, Soker S, Atala A (January 2007). "Isolation of amniotic stem cell lines with potential for therapy". Nature Biotechnology. 25 (1): 100–6. doi:10.1038/nbt1274. PMID 17206138. ^ a b c d e Kimbrel EA, Lanza R (December 2016). "Pluripotent stem cells: the last 10 years". Regenerative Medicine. 11 (8): 831–847. doi:10.2217/rme-2016-0117. PMID 27908220. ^ a b c Takahashi K, Yamanaka S (August 2006). "Induction of pluripotent stem cells from mouse embryonic and adult fibroblast cultures by defined factors". Cell. 126 (4): 663–76. doi:10.1016/j.cell.2006.07.024. PMID 16904174. ^ Yu J, Vodyanik MA, Smuga-Otto K, Antosiewicz-Bourget J, Frane JL, Tian S, Nie J, Jonsdottir GA, Ruotti V, Stewart R, Slukvin II, Thomson JA (December 2007). "Induced pluripotent stem cell lines derived from human somatic cells". Science. 318 (5858): 1917–20. Bibcode:2007Sci...318.1917Y. doi:10.1126/science.1151526. PMID 18029452. ^ a b Robinton DA, Daley GQ (January 2012). "The promise of induced pluripotent stem cells in research and therapy". Nature. 481 (7381): 295–305. Bibcode:2012Natur.481..295R. doi:10.1038/nature10761. PMC 3652331. PMID 22258608. ^ Beckmann J, Scheitza S, Wernet P, Fischer JC, Giebel B (June 2007). "Asymmetric cell division within the human hematopoietic stem and progenitor cell compartment: identification of asymmetrically segregating proteins". Blood. 109 (12): 5494–501. doi:10.1182/blood-2006-11-055921. PMID 17332245. ^ Xie T, Spradling AC (July 1998). "decapentaplegic is essential for the maintenance and division of germline stem cells in the Drosophila ovary". Cell. 94 (2): 251–60. doi:10.1016/S0092-8674(00)81424-5. PMID 9695953. ^ Song X, Zhu CH, Doan C, Xie T (June 2002). "Germline stem cells anchored by adherens junctions in the Drosophila ovary niches". Science. 296 (5574): 1855–7. Bibcode:2002Sci...296.1855S. doi:10.1126/science.1069871. PMID 12052957. ^ Master Z, McLeod M, Mendez I (2007). "Benefits, Risks and Ethical Considerations in Translation of Stem Cell Research to Clinical Applications in Parkinson's Disease". Journal of Medical Ethics. 33 (3): 169–73. doi:10.1136/jme.2005.013169. JSTOR 27719821. PMC 2598267. PMID 17329391. ^ Kang KS, Kim SW, Oh YH, Yu JW, Kim KY, Park HK, Song CH, Han H (2005). "A 37-year-old spinal cord-injured female patient, transplanted of multipotent stem cells from human UC blood, with improved sensory perception and mobility, both functionally and morphologically: a case study". Cytotherapy. 7 (4): 368–73. doi:10.1080/14653240500238160. PMID 16162459. ^ Yen AH, Sharpe PT (January 2008). "Stem cells and tooth tissue engineering". Cell and Tissue Research. 331 (1): 359–72. doi:10.1007/s00441-007-0467-6. PMID 17938970. ^ Hanson C, Hardarson T, Ellerström C, Nordberg M, Caisander G, Rao M, Hyllner J, Stenevi U (March 2013). "Transplantation of human embryonic stem cells onto a partially wounded human cornea in vitro". Acta Ophthalmologica. 91 (2): 127–30. doi:10.1111/j.1755-3768.2011.02358.x. PMC 3660785. PMID 22280565. ^ Vastag B (April 2001). "Stem cells step closer to the clinic: paralysis partially reversed in rats with ALS-like disease". JAMA. 285 (13): 1691–3. doi:10.1001/jama.285.13.1691. PMID 11277806. ^ Gurtner GC, Callaghan MJ, Longaker MT (2007). "Progress and potential for regenerative medicine". Annual Review of Medicine. 58: 299–312. doi:10.1146/annurev.med.58.082405.095329. PMID 17076602. Bone marrow transplantation is, as of 2009, the only established use of stem cells. ^ Valli, H; Phillips, B; Shetty, G; Byrne, J; Clark, A; Meistrich, M; et al. (2014). "Germline stem cells: toward the regeneration of spermatogenesis". Fertility and Sterility. 101 (1): 3–13. doi:10.1016/j.fertnstert.2013.10.052. PMC 3880407. PMID 24314923. ^ White, YAR; Woods, DC; Takai, Y; Ishihara, O; Seki, H; Tilly, JL (2012). "Oocyte formation by mitotically active germ cells purified from ovaries of reproductive-age women". Nature Medicine. 18 (3): 413–21. doi:10.1038/nm.2669. PMC 3296965. PMID 22366948. ^ Bubela T, Li MD, Hafez M, Bieber M, Atkins H (November 2012). "Is belief larger than fact: expectations, optimism and reality for translational stem cell research". BMC Medicine. 10: 133. doi:10.1186/1741-7015-10-133. PMC 3520764. PMID 23131007. ^ Greenhough S, Hay DC (2012). "Stem Cell-Based Toxicity Screening: Recent Advances in Hepatocyte Generation". Pharm Med. 26 (2): 85–89. doi:10.1007/BF03256896. Archived from the original on 2012-06-16.